In a new adventure for Picture Book Club we’ve decided to offer you something in between IRL meetings to satisfy you’re craving for all things picture book related! 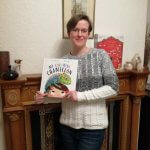 Our very first present is an interview with debut picture book author, Leonie Roberts. Hi Leonie! Your book ‘My Colourful Chameleon’ is out now in the US and will be landing on UK shores on 25th January 2018. What inspired you to write it? I used to write poetry as a teenager but then real life took over and I stopped. 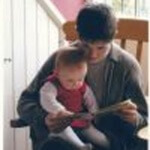 A few years back I started up writing again, poetry initially and then picture book stories. I have no idea what inspired me to write this particular book. I was living and working in Italy at the time and one day, as I walked home from work, the idea just popped into my head! 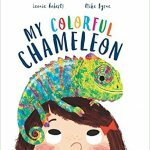 At Picture Book Club Towers we’ve seen a copy of The Colourful Chameleon. It’s gorgeous! But we’re going to be tricky and ask you to describe it in one word! We second that! At PBC, we’re all about meeting IRL. Have you any plans to get out and meet your readers? As I’m UK-based and the book is only out in the US at the moment, doing real-life events is a bit tricky so I’m really looking forward to the new year and the UK release when I am planning on organising a library tour. I’m also working on setting up some author events in bookshops. Excellent! If there are any indie bookshop owners, Waterstones or Foyles events people out there, you can get in touch with Leonie on her facebook page or on twitter. You’re welcome at an IRL PBC meeting anytime! Tell us about your goals as a writer? My picture book heroes are Jill Murphy and Lydia Monks because I never tire of reading/seeing their work. My goal is to one day write a book that someone loves as much as I love “Peace At Last”. As well as continuing to work on other picture book texts, I have also recently begun writing some early chapter books. That sounds exciting! Just because we’re nosy, we’d like to finish with a few quick-fire questions. Christmas hot chocolate or Christmas coffee? Favourite super-power and how would you use it? Thanks Leonie! We’re always happy to welcome new picture book authors into the Picture Book Club fold. The more, the merrier! The Colourful Chameleon is published by QEB publishing in the US and is coming out in the UK on January 25th 2018. You can get in early and pre-order now! Married, middle-aged mum of one. Reluctant to rhyme but longing for alliterative loveliness. Positively potty about picturebooks!